As many of our readers know, we had an amazing time taking our custom PartySaurus Rex around town prior to the opening of PartySaurus Rex in theaters. Well, the fun didn't stop there - today we were lucky enough to have a very candid interview with the charismatic director of PartySaurus Rex, Mark Walsh. He was so gracious to take the time to talk with us and really help us learn more about the short film that he and the team worked so hard to create. If you loved the short like we did, you'll be amazed at all the details Mark discusses about the voice actors, the origins of the "What up fishes" line, working with Pixar Canada as well as receiving critiques from John Lasseter. If you're a Pixar junkie, this is not one to miss - all jokes aside, his candor and insights will not only entertain, but educate you! 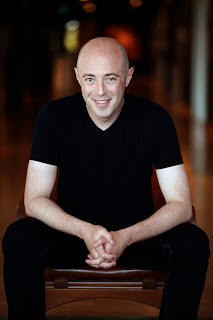 Although we highly encourage our readers to listen to the recorded audio of the interview to hear Mark's funny lines that he repeats from the short, we understand that it isn't always possible, so we have transcribed the interview for your convenience as well. We hope you enjoy the interview as much as we enjoyed talking to Mark and please, let us know what you think of the interview in the comments below! [Pixar Post - PP] What we wanted to start with, is that it all "starts with the pitch" and we've heard that your initial pitch contained three ideas and you eventually landed on (with the discussion with John Lasseter) PartySaurus Rex as the idea. So, can you go into some of those details of the pitch process for PartySaurus Rex. And then...if you can...what those other story lines were? [Mark Walsh - MW] Yeah, I loved all three of those and I had four others that were just single drawing ideas that I'd still love to pitch again. I can't tell you each one of them because what if they decide to make one...which is hopeful on my part [PP laughs]! PartySaurus Rex was originally called...well, I had about eight drawings up, maybe more, and it was the same overall structure and design as it is now, but it was called "Bath Time". John (Lasseter) liked that one because he liked the idea of there being a pool party and as I developed it, it became more like a college house party. I like the idea that Rex was a party pooper and that they would think differently of him after having this experience. Two things happened in the process - two important things - one was that BT got involved as the composer. John Lasseter has worked with BT on a Mater short but BT...his music is really thumping and is modern stuff and John really liked him as a person and his music and thought it would be something new and different for us [Pixar]. As I began researching BT, met him and started looking at the scene in which he performs, I thought, "Oh my gosh we can take this a lot deeper" - and that's where it got more and more like a full on rave. Which worked great because the suds are like one of those suds parties - and if you search on "suds party" online you'll see all these huge clubs in Ibiza and Greece and even New York and Los Angeles, where they unleash these suds machines down and everybody is dancing in foam and I thought, this is totally perfect. So, that was number one and number two was that I discovered it was necessary to motivate Rex throughout the short. I wanted to show that each time he knocked somebody into the tub, it wasn't just an accident that he felt bad about - that he actually did it on purpose, so that the end of the short would be him trying to account for his sins and that he was trying to stop what he had started. And I thought, well what do I do to make him push those people in when I know that's not in Rex's nature. I thought, well we've got it set up already where I wanted to explore that he was kind of a nervous guy...and do the opposite - so what if we have those voices that are inside...those voices that are inside that say, "That's impractical" [loud, boisterous voice]....and I thought, maybe that's what we'll do - we'll do the reverse where people will ask PartySaurus to get them into the party and he'll say, "absolutely not" and then he'll hear the echo of Mr. Potato Head saying "Party Popper" [loud, boisterous voice again]. The guilt over that and embarrassment would make him think, "no, no, I want to do something different because I don't want people to call me that". That's what motivated him knocking in Helga Von Bubbles and him knocking in the colander girls (as I call them) [the dolphins]. 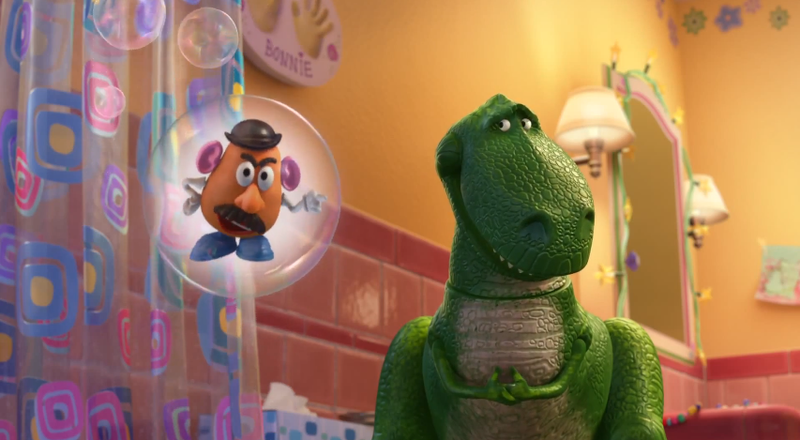 That started to make the short really interesting and it contained the really un-Toy Story thing of having that shoulder angel of Mr. Potato Head was a funny idea and I think the capper of that was Bob Pauley's idea to have Mr. Potato Head in the bubble. I think it was something unexpected and kind of funny and it's been fun in the hallways here - people will pass me by and say "Party Pooper" [loud, boisterous voice] [All laugh]. So, those are the two big changes that happened in the short...oh, and along with the name [change] of PartySaurus Rex. [PP] So we read in another interview that you enjoy working with the voice talent - we you able to work alongside any of the actors and collaborate on any dialogue with them? [MW] I worked with every single one of them. The Toy Story actors have lived in that costume of their character for so many more years than I've been working at Pixar and so you may have written a line that you think, "this is the way Mr. Potato Head would say this" or "this is the way Woody would say this"...or especially Rex, and the actor will do it and then often times they'll say, "You know what, I wonder if Woody would say it 'this' way" and they'll put their own spin on it and it's always better - it's always better! I found that in making this short, the key to making films is collaboration. As an animator I always preferred it when my director asked me to bring something to the table and valued the ideas that I brought. Even if he ended up not using them, we can at least have the discussion about it. So as a director I enjoy collaborating with everybody in the pipeline...with the actors, with the story artists with the editor especially. With BT, it started off as an auteurship where I thought, "I know exactly what I want", but I found that after I set that table...if you think of it as a party by itself...you set the table, you put out the chips and you tell people "well, this is what the party's going to be", but it's the people that come to the party that make the party. It's their stories that they bring, the friendships that they strike up, it's the group that makes it over the top. So, for me, that's kind of what I learned about filmmaking from John [Lasseter] - was that you tell everybody what you want, what is important to the story and what you need, but it's what they bring to it that takes it to the next level more than any one person could do. You're watching the talents of everybody, not just the one person. It's been really gratifying and because of that, I can still watch PartySaurus and can be entertained, not by myself, but by all these things that people brought to the movie. [PP] That's actually a big thing for people to note - I'm going to use that as my big takeaway from this...the fact that you don't get so caught up in the craft of your original idea that you stifle other people. [MW] Yeah, and it's challenging as a new director here. It's something that I faced in the beginning and it wasn't going the way I wanted it to and it wasn't getting where I wanted it to go - and I found that as soon as I 'let go' of this and just told people what the parameters were...I would say, "I want this line of dialogue in the movie for this particular reason" and then I realized, "Well, as long as that reason is met and as long as I have somebody saying 'this general idea', they can say it any way they want" - why not find the most entertaining way to do it? [PP] Speaking of lines of dialogue, we were both floored at the "What up Fishes" line as well as the murky bottom of the tub - I think that was just pure genius...a detail that could have gone unnoticed, but was awesome to have it thrown in there. But what we do want to know is how that line came about? [MW] That was the most difficult line and the most difficult gag in the entire movie. Do you guys ever look at Calvin and Hobbes? [MW] Yeah, I love Calvin and Hobbes and Watterson has said that the best endings of those little miniature series that he'll get stuck on...the ones where he doesn't have an ending...he's building up each week putting in another episode of a particular story and he has no idea where it's going and he doesn't have an answer and so he just keeps stretching the story so the conflict or the story keeps getting more and more and more interesting because he doesn't know what he's going to do...he doesn't know what he's going to do and at the very end he's freaked out, the deadline is tomorrow and all that pressure comes down. And then because of that, he's painted himself into a corner...out comes this solution to the problem he's created that ends up being much more creative than if he had planned it. [PP] I think that's a common thing among artists - it just one of those things where you eventually do corner yourself and you say, "I've got to do something". [MW] Right, and that was one of the last pieces of dialogue to be recorded. It's me in there doing, "What up fishes...what, what"! [MW] Yeah, that's me - I went to a soccer game in England recently and I noticed that all of the men around there...they don't talk like normal guys. When they're trying to be men, "THEY TALK LIKE MEN BUT BIG VOICED...WHAT, WHAT...HEY!" You know? 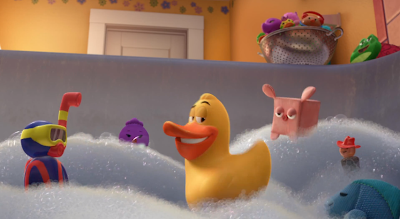 So that's where that voice came from, but the line itself, I knew I wanted to have guys underwater...that was there in the very first cut because if you're playing in the bath you bring your toys in that don't belong in the bath and there's always things that sink. So I thought well that's funny, it's like the neighbors downstairs that can't go to the party...I want to have that in there. I even tried a version...I didn't show this to John...but I tried a version where it was even Knick, Knack down there. He saw the girl from Knick, Knack and he went over to get her and just as he was almost there, the knob fell on him and trapped him [all laugh]. It was funny also but to seemed to referential and it took me out of the short. Then there was another version where it was the glowy guy and I thought, "well what if he's like a snow cone and he came down there" and I just wanted him to say something...and I didn't know what I was going to say. I didn't have a solution and everyone got quiet for a second and it was like, "What up...what up homies...what up guys...how you doing" and then Jay Schuster who is a fantastic designer here at Pixar, is really good with puns and Jay was like, "What up my fishes" and we were like, "WHAT UP FISHES"...alright, let's work on that. So we got in there...into the recording booth...and I recorded a few other things along with "What up Fishes" and when Axel Geddes, our editor cut in, "What up fishes", especially with the "What, What" afterward it became really funny. But there's an alchemy to that gag when you watch it when he lands, there's a "Booooommm" that happens that we pulled from a BT track. When that wasn't in there it wasn't funny...when the "What, What" wasn't in there it wasn't funny and even then, without the "YEAH" [cheering] from the guys, it wasn't funny. [PP] Yeah, it all had to come together. [MW] There's a real alchemy to that joke that all of those elements in there...for some reason you get it in there and it makes you chuckle. It's been the most quoted part of the movie..."What up fishes"! I'm very grateful to Jay for it. That piece, in the whole process of the movie, when I let go and asked other people what they could bring to it, it became better than what I could do with it and it's still literally my voice in there but it's not just me, it the group that made it good. Which is why again, I can laugh at it when I watch it - because it's not just watching my own self, it's watching my friends. [PP] Well speaking of watching your friends and such...so you moved into the directing role obviously with a lot of animation experience - we're you able to work amongst your friends and actually animate on this one, or were you just so stuck in the direction portion of it that you weren't able to get your hands in it from an animation standpoint? and the Toy Story double feature teaser where Rex is flat. But for PartySaurus, I couldn't because the team was in Canada and it turned out to be a really good thing for me because, again, if you're hoarding all that stuff, it sends a message that you don't think that other people...you don't trust other people. And for me it was a really healthy thing not to animate because it sent a message that I trusted them, and I did. There isn't a scene in PartySaurus that isn't as satisfying to me as if I had animated it myself. I felt completely satisfied with every frame of that movie from that team and I think that they felt it was a big deal for them to feel that trust...and they didn't let me down. I was actually really glad to not animate - as a director I think it's healthy. [PP] So obviously you mentioned Pixar Canada and we were really excited to see some of the other comments you've said in other interviews about Pixar Canada...and it being so youthful and it being so much like the early days of Pixar in Emeryville. So, talk with us a little bit more about the crew that you worked with for PartySaurus Rex as well as the process of working between the two studios a little more. [MW] OK, well, we worked through a Skype-like connection where I can draw on the screen of their work on an overlay drawing digitally and then. Pixar Canada is founded by three different guys - Darwyn, Amir and Dylan. Amir (Nasrabadi) is from Disney as a production guy - he's very, very, very smart and really, really fun and I think he's a huge part of why that studio has such a good vibe to it. The second character is Darwyn Peachey. Darwyn has been an Pixar for a very long time and has a lot of respect and he ran the technical end. 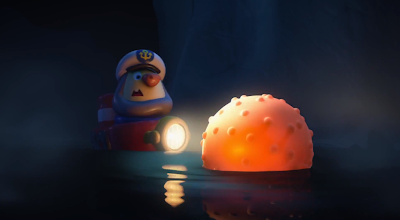 Dylan Brown is the third character and Dylan and I had worked on Finding Nemo. He was the supervising animator when I was a directing animator on Nemo. And then we both supervised Ratatouille animation together - so Dylan Brown is almost like a Brother to me and I trust him completely. The three of those guys up there have really carefully and consciously created a culture because they're watchful of it and conscious of it - it's not an accident. That studio is, like I said, small - our whole animation department here at Pixar in Emeryville is like one-hundred people and in Vancouver, their entire studio is like seventy-five people. It's tiny! I know everybody's name who works there since it's so small. When I go up there the vibe is just great, they really want to make a great film. They treat it like 'Pixar', they're happy to work at Pixar and that Canada studio has top, top talent up there and it's a really great environment to work in. [PP] So I have kind of a techie question to ask. We've heard that some Pixarians refer to a difficult scene or a technological challenge as a "Yeti's cave" (from Monsters Inc. with the snow/fur challenge). Was there a "Yeti's cave" challenge for you guys on PartySaurus Rex? [MW] Technically - the suds! The suds were the challenge because if you don't get them right - if they're too small and if the spheres are too evenly spaced, it looks like a dab of caviar. If they're too large, it looks a little bizarre. You want the right mix of fluffy...but realistic as well, so it look half 'cartoon suds' and half 'real'. And that was a real challenge for them and it's a very expensive part of making a movie when you want to render that. 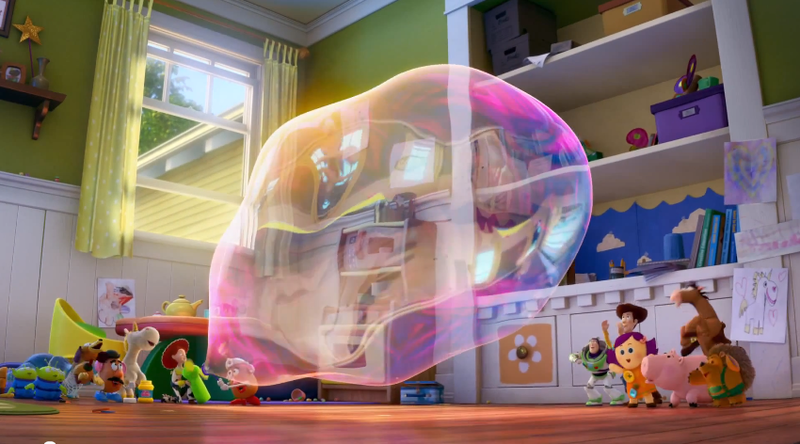 A scene that has Rex in it, but has suds in front of him...you know all that light has to calculate. There's a light source hitting the bubble, it's refracting inside the bubble, hitting another bubble, refracting in that bubble and so on and so forth - and it's very expensive. The fact that it's all sitting on top of simulated water is very expensive and we animate the character first and then simulate the water so sometimes the character isn't on the water surface and then we have to go back in again and fix that. There's a big back and forth with it. Darwyn was really concerned in the beginning, he would say, "Now you know Mark, I don't know if we're going to be able to do this. We might have to re-shoot the film so that we're not showing the suds", and I was like, "OH NO, how can we not show the suds" [all laugh]. They would do this to me consistently up there '(bless them...Pixar Canada)' - they'd get me on camera, on the Skype thing and the whole room would be there and they'd be like, "well Mark, now I'm glad we lowered your expectations because we want to show you this clip" and then they would show this clip that just completely blew me away. I would just go, "WHAT, NO, WOW!" you know, and they would all laugh and I would realize that it was somewhat cruel to put me through that [laughs]. But that's one of the reasons that I love them so much - they would push beyond what they thought they could do because they wanted to make me happy...and I really am! That sequence, much like "What up Fishes" one - that sequence was done, and redone, and redone a million times over. That was the last sequence to be done and it was a big pain. [side note] You probably have already this story, but the Yeti is Sulley. He's Sulley's model pushed around with different hair put on him. The Yeti's cave is like a story problem that can't be solved until the last minute - it's the last thing to be animated, it's rushed, it's kind of a MacGyver job. [PP] Talking about the suds and everything...and some of the details you were talking about being happy with. 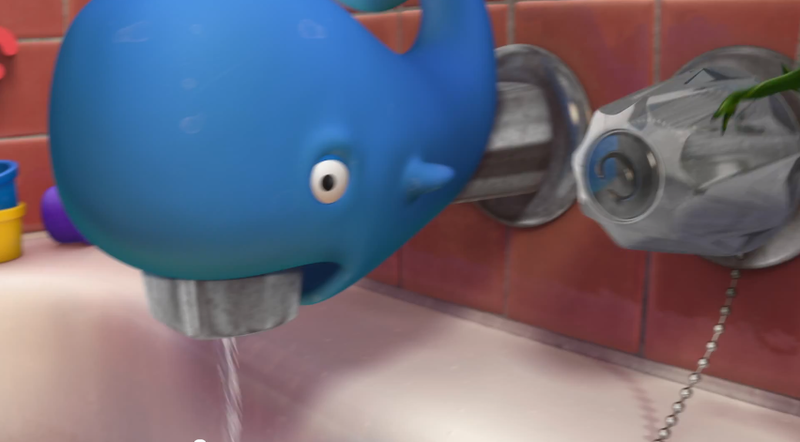 I guess this is a really small point, but one of the things that just totally blew us away too was the...on the downspout with the whale, how it has the dried water droplets on it and everything. I mean there's just so much detail that they put into that. [MW] Captain Suds! When you see it, it's just so real right? Yeah, and that's the thing, John knows his materials really, really well. John has gone even to toy manufacturing houses and seen and knows how they actually put the things together and he'll say, "Well, I don't know if this thing would be there, it would probably be here". But the truth-to-materials is really important to John and I learn so much from notes like that...like, "Hey, sit down here let me show you something. We usually do it like this". I mean, how much would you pay to have John Lasseter look at your work with everything he knows, right? And yet, I'm getting paid to go to work every day at Pixar where I get to direct an idea that I came up with, with the most talented people in the world and when it's done, John Lasseter looks at it and tells me how I can make it better. [MW] But it's not about you, it's about the work...it's about the project. So, there's still support for you, because John has been in meetings where he's shows his work to the Brain Trust, and the Brain Trust says, "John that doesn't work". He knows what it's like, so it's never personal...it just about hammering on the work, "How can I make the work better, how can we make it better?" All throughout the process there was a lot of support from the other directors here at Pixar because they all know what it's like. You can see why the movies are as good as they are and also why they take as long to make and why they're so difficult to make - because good enough is not good enough! Everything has to be as great as it can possibly be before the deadline is up. [PP] Yeah, and I know John Lasseter is quoted quite often as saying, "A Pixar movie is never done, it just is released". [PP] Yeah, exactly. We were pretty much being respectful of the time so we basically just wanted to wrap up with a final closing comment because it really is...I know we already talked about our custom PartySaurus Rex that we made, based on the amazing rendition of that character that you and your team created. But to us, all of life is about creating memories in the same way that Pixar movies create a series of memories for the viewers. And the custom Rex that we made has taken us, just so much further than we could have ever imagined. From the people we talked to when we were carrying it around, to the ability for us to speak with you and Briana today. So we basically just want to say thank you from the bottom of our hearts to you and your team for giving us these memories. [MW] Oh my gosh, T.J., that's amazing! 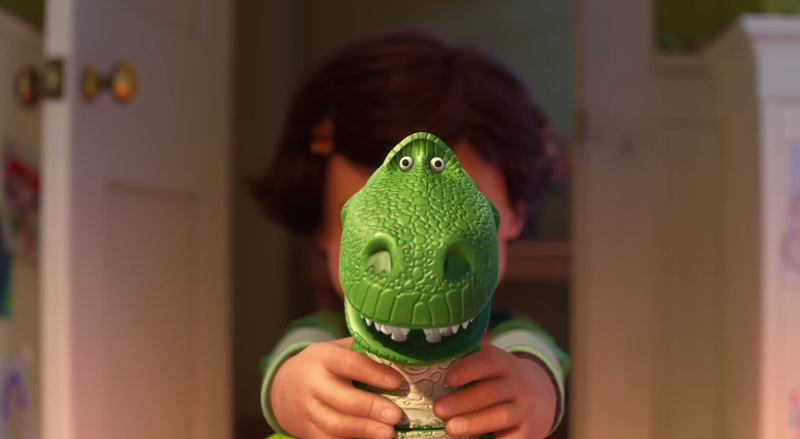 You guys are the ambassadors for PartySaurus and in a lot of ways an ambassador for Pixar and that means a lot to us. [MW] I was telling somebody earlier that we largely make these movies in a vacuum - it's not like you're on stage and you tell the joke and you get a laugh and you know whether it works or not. You write the joke, you record the joke, you cut the joke in and somebody chuckles, and you're like, "I don't know if an audience will think it's funny - I think think it's funny I guess" and it stays in. You just don't know if the whole thing works until two years later when you're watching it, there's such a delay, but for me, having you guys put that energy into it - because I can see that you guys are having a good time with it. ...the conversation continued to go back and forth for a while talking about the custom Rex that we created and some more Pixar conversation. What a blast talking to Mark and gaining all these insights. As a side note, one thing you cannot see is that Julie was freaking out - she was so nervous because we look up to Mark as an artist and since she heard how much he liked her Rex, she was just floored...which you can hear in her voice on some of the questions! Thank you again to Pixar and Mark Walsh for this amazing opportunity! To see more of our custom PartySaurus Rex, click here. 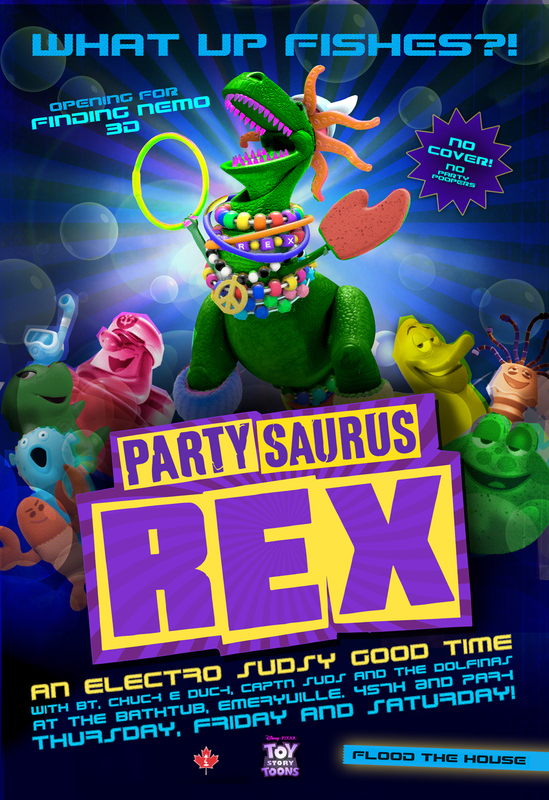 To listen to our review (and listen to a clip) of the official song from PartySaurus Rex, PartySaurus Overflow, click here.